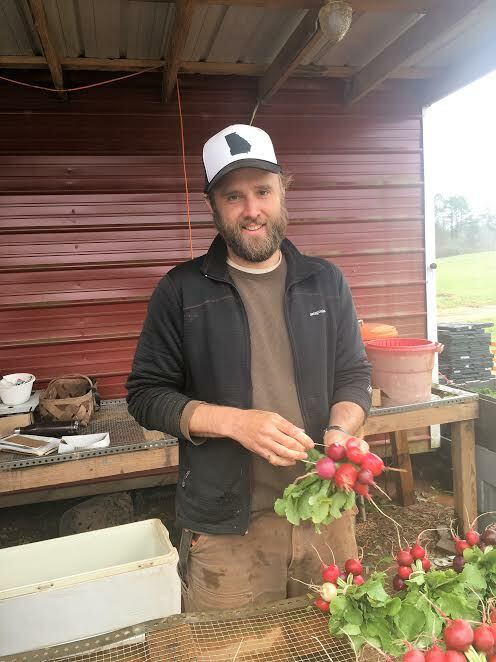 John Davis of Cosmos Organic Farm in Carrollton, Georgia finds fulfillment and community engagement through his passion for farming. He started the farm in 2011 after leaving the corporate world to pursue a Masters in Theology in conjunction with a sustainable agriculture focus. John enjoys farming’s physical as well as business-side demands. For John, the time harvested in both plant and people is vital to his business. Cosmos currently sells produce at 5 different markets in and around Atlanta, 3 of the Community Farmers Markets and 2 in Peachtree, which provide the lion’s share of the farm’s revenue. The good relations and mutual appreciation stem further than the deepest roots planted at Cosmos. At farmers markets, farmers are able to exchange their wholesome, fresh food for local support and a place in the community. Support the farmers like John that show up every market day.